On 17 August 2014 two hundred swimmers made their way to Toronto’s Centre Island to participate in the second annual Toronto Island Lake Swim. In the days leading up to the race social media was abuzz with the question “Are we really going to swim in Lake Ontario?” While most of the excited pre-race chatter was focused on how cold the water was threatening to be (the temperature rose to a tolerable 16C the morning of the swim) the graver issue, of whether or not the lake is clean enough to swim in, was also deliberated. The Toronto Island Lake Swim was inspired by Toronto’s history as a city of swimmers. In the not so distant past Toronto’s waterfront was synonymous with recreational water activity. The waters off the city and Toronto Island used to be filled to the brim with swimmers during the summer days of the 1800s and early 1900s. 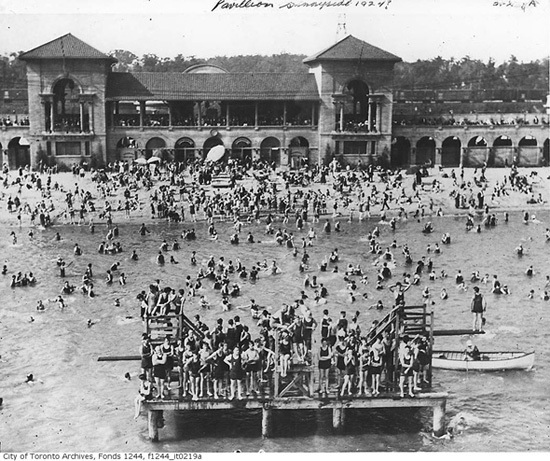 In fact the majestic Sunnyside Pavillion was built in 1925 to accommodate the hundreds of thousands of beachgoers at Sunnyside Beach who needed a place to change into their bathing suits. Marathon swims, some as long as 34km, were hosted annually by the Canadian National Exhibition. They drew huge crowds and an impressive number of participants. Some of the most famous Canadians became heroes after completing incredible swims across Lake Ontario during this era. Toronto Island Swim Race, 1914. Image found on BlogTO and sourced from City of Toronto Archives. But by the end of the 1950s the water in the lake was so polluted it consistently made people sick. City beaches were made permanently off limits as a way of protecting public health. As a result Toronto, a city of water-lovers, grew distant from its waterfront. These days, while most of Toronto’s 11 official beaches are clean most of the time, the health of the lake’s water is still a question. Issues like sewage and stormwater runoff are major threats to Toronto’s water. In 2013 alone there were 38 secondary bypasses in Toronto, totalling over 4 billion litres of wastewater, that entered the Humber River and Ashbridges Bay and made their way into the lake. But the good news is the water quality is improving and more and more recreational water users are returning to play in Toronto’s water. The swimmability of the water in the Lake Ontario is behind everything Lake Ontario Waterkeeper does with Swim Guide in our watershed — not just because we want to prevent people from getting sick from swimming in contaminated water. And not only to address both short term and chronic environmental issues affecting our watershed. We want to help ensure our homewaters are swimmable, for the long term, so that Torontonians can get back into the lake they love so much. 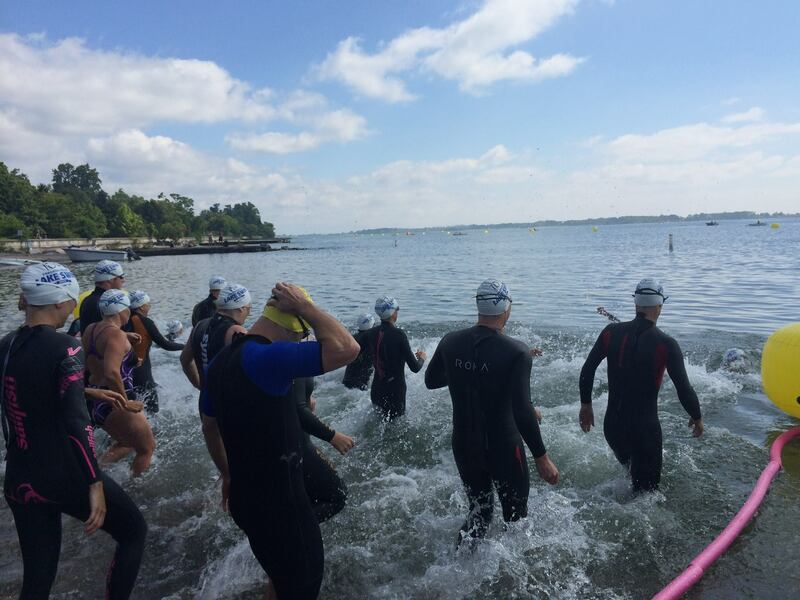 Swim Guide was delighted to participate in the 2014 Toronto Island Lake Swim. The water at Centre Island Beach was cold enough to take your breath away. But the water was clean and clear on the morning of the race, with sailboats, paddlers, and stand up paddle boarders crisscrossing the horizon. The water was as it should be — teeming with swimmers.